I also interviewed John for Adventures in SciFi Publishing (in the meantime, listen to our interview with him from a few years back). 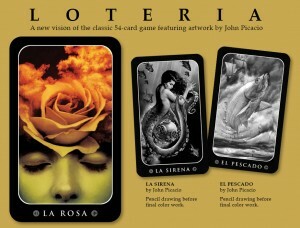 Based on what I saw at the con (and the story I heard behind them, which we’ll discuss in the forthcoming interview), his Loteria cards are off the chain. For now, you can learn more at his site. On the friend front, I spent a good deal of my non-scheduled con time with the Hadley Rille Books tribe and KC tribe (per usual I thoroughly enjoyed my annual lunch with Byron — though it was bit rushed this year and didn’t include the requisite pork tenderloin sandwich. Byron does recommend an interesting sounding book, The Particular Sadness of Lemon Cake ). Read Mark Nelson’s blog post at Heroines of Fantasy for a sense of what the HRB crew is all about — great people and amazing authors widely regarded by Publishers Weekly. Though I didn’t have a chance to really catch up with them much (though I did get a great hug from Teresa), it was amazing having my former VP instructors the Nielsen Haydens in the building. I heard whispers from people all over the con talking about their insights. Speaking of which, I, like Teresa, had the opportunity to participate in Journey Planet’s “Themed For Your Pleasure” podcast. My segment with the zany Christopher Garcia is not up yet (it may never be made available), but Teresa’s is, so check it out. As many of you know … I’ve been MIA the last six to seven months, so also watch for my “Restoration Blog” and “If only I were a Time Lord …” posts over the next few months. I’ll recount some things worth noting from my hiatus.